Since its inception in 2006, the Mahatma Gandhi National Rural Employment Guarantee Act (MGNREGA) has been blamed for causing shortage in farm labour and decline in agricultural productivity. Using this as an excuse, the government plans to slash budgetary support to the job scheme under the Act. In the past six years, the scheme has created 12,000 crore person-day of works with a total expenditure of Rs 1,66,760 crore. In the face of the lowest-in-a-decade economic growth and rising fiscal deficit, finance minister P Chidambaram targeted the scheme for a drastic cut in funds this February. He argued that job demand under the scheme is reducing. He was supported by agriculture minister Sharad Pawar, who believes the scheme has precipitated a farm labour crisis, affecting overall productivity. He alleged the scheme has resulted in increase in wage rate, making agriculture less profitable. In 2011, Pawar suggested a 50 per cent wage subsidy to farmers due to rise in agricultural wage rate post-MGNREGA. Both the ministers raised this matter in five Cabinet meetings in January-February. On February 6, rural development minister Jairam Ramesh wrote to the prime minister against the surmises of Chidambaram and Pawar. According to Ramesh, the increase in daily wage rate is a positive impact of the scheme. The fight brings into focus the much-talked about fear of such a public wage programme: its impact on agricultural labour market. But the debate seems to be more of myth building. Government data itself junks the allegation that MGNREGA has affected availability of farm labourers. People hardly demand work under the scheme during agricultural season. 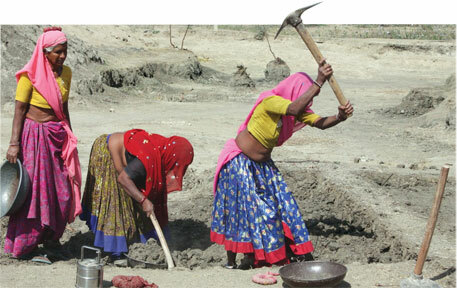 Unlike other public wage programmes, MGNREGA is driven by demand. It is assumed that people will not demand work during the agricultural season. A 2010-11 analysis shows 70 per cent of employment is demanded during the lean agricultural periods of April-June and January-March. What’s more, since the scheme became pan-India in 2007-08, the average number of employment per household has not crossed 54 days a year. So, people have worked just for 16 days during agricultural season. In a comprehensive report on 12 states, the International Water Management Institute stated that to have a major impact on the labour market, the scheme would have to employ a significant number of people during the peak agricultural season. An average of 3.5 million people demand jobs annually in Andhra Pradesh. But during agricultural season it reduces to 0.5 million, says A Murali, former director of MGNREGA in the state. Andhra Pradesh is considered successful in the scheme. 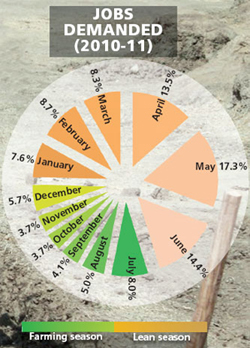 Its agricultural yield increased from 16 million tonnes in 2005 to 22 million tonnes in 2012. This does not support the argument that MGNREGA affected farming output, says Murali. Decline in farm labour has been a trend much before the scheme was launched. The Planning Commission emphasises this in its 12th Plan document. There is hardly any impact on agriculture output as cropping intensity has increased, it adds. Since 2000, surveys by the National Sample Survey Organisation have been reporting fall in farm jobs. The Union ministry of labour and employment says it has no evidence of shortage in farm labour and any impact of MGNREGA. As far as rising farm wage rate is concerned, it’s surprising the agriculture ministry is opposing it, while the government is celebrating it as an aam admi empowerment. The Ministry of Statistics and Programme Implementation has shown that the scheme raised the wage rate. The wage rate grew by 2.7 per cent annually during 1999-2005. After the scheme it increased by 9.7 per cent annually during 2006-09. The general fear is that the rise in wage has increased the cost of production or discouraged people from hiring labour. Reetika Khera, an economist with IIT- Delhi, says, “The scheme has made labourers aware of their rights to demand minimum wages.” The government has been highlighting this as a victory. It has always hesitated in increasing the minimum wage due to pressure from the farmers’ lobby. The scheme created the right bargaining instrument for labourers to demand more. In 19 states the basic wage under the scheme is higher than that of the states’ agricultural wages. But this is one of the least appreciated impact of the scheme. First, it made provision for equal wages for both men and women. Second, as a result of the first provision, there is a surge in women’s participation; women availed 45 per cent of the total employment. “It is the first scheme that has benefitted women equally,” says Palomi Mistry, president of Mahatma Gandhi National Rural Employment Guarantee Scheme Workers’ Union. Anurag Modi, an activist working on people’s rights under the scheme in Madhya Pradesh, believes if the problem of wage delay was solved, there would have been more financial benefits. He argues that the problem is a flaw in wage rates among various sectors. “The minimum wage in construction work is Rs 190, in MGNREGA it is Rs 132 and in agriculture it is Rs 100. The scheme is also notorious for delay in payment. This leaves no option for people but to migrate,” he says. The conflict between the Minister of Agriculture (who thinks higher agricultural wages are bad because they make agriculture less profitable) and the Minister of rural development (who welcomes wage rises because they decrease rural poverty) is interesting. Another aspect, related to the Minister of Agriculture's concern, is that higher wages could in fact be seen as something that will lead to higher agricultural productivity. One could say that there is a parallell to the and could in fact be related to the solidarity wage policy which was practised on the Swedish labour market from the 1950's. The solidarity wage policy meant that wages were negotiated centrally and set at a level that meant that the most productive companies made good profits while the least productive fell by the wayside. This helped to hasten structural transformation in which employees in low-productive companies would move to highly productive companies, while wage-earners in the public sector and low-productive companies could increase their pay. The structural transformation of society was hastened when the wage levels between different sectors and regions were evened out. The policy has sometimes been called Ã”Ã‡Â£flyttlasspolitikÃ”Ã‡Ã˜, literally Ã”Ã‡Â£moving van policyÃ”Ã‡Ã˜, the Swedish equivalent of the British Ã”Ã‡Â£on your bikeÃ”Ã‡Ã˜.